Chicken and waffles have quickly become a staple in the south. 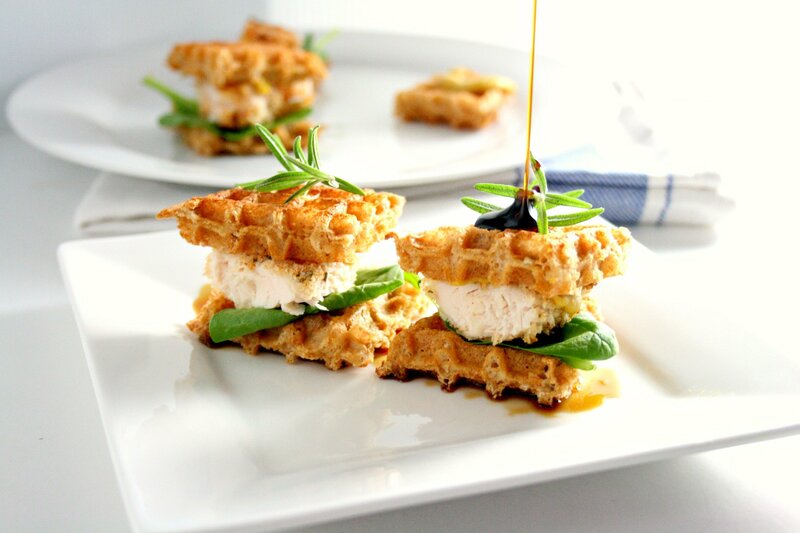 My chicken and waffles sandwich puts a healthy twist on the classic southern slider. I remember the first time I saw chicken and waffles on a menu. I thought it was the strangest combination I had ever seen! A salty and savory piece of fried chicken with a sweet waffle and syrup? So odd! As this combo grew in popularity and I broadened my taste bud’s horizons, I discovered that I was fond of this unique food pairing. Glad that I jumped on the chicken and waffle train when I did because in Nashville, it’s a staple! You see this delicious combo on virtually every brunch menu! I am SO excited about this Recipe Redux challenge sponsored by Sabra. I love sabra hummus, and was even more excited to hear about their new line of sandwich spreads. Their spreads have 75% less fat than mayo and come in a convenient squeeze bottle. Best of all they taste delicious and use fresh flavors and ingredients. I’m not a big mayo fan, so these spread are right up my alley! 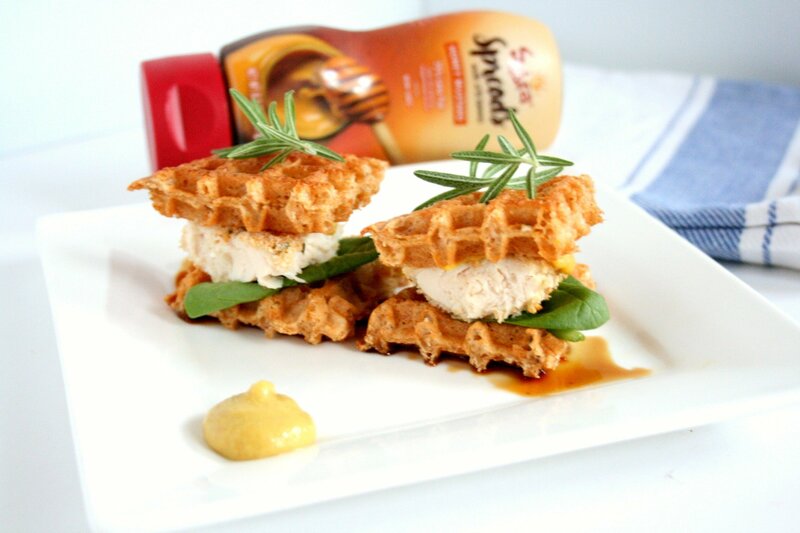 I used both the Honey Mustard and Garlic and Herb Sabra Spread in my Chicken and Waffle Sandwich recipe. They also have a delicious sea salt and cracked pepper flavor. To say the least- I’m obsessed with these spreads! I lightened up this chicken and waffles sandwich by creating a crispy and delicious baked chicken tender. You get all the crunch with less calories! I used the Garlic and Herb Sabra Hummus spread mixed with egg whites to create an a flavorful egg wash. I dredged my chicken in this mixtures before coating it in my rosemary and panko bread crumb mix. You can make your own waffles or take the easy route and buy them frozen like I did. Pop them in the toaster oven and top them with the honey mustard spread, spinach, and crispy rosemary chicken. Serve the Chicken and Waffles Sandwiches with maple syrup, or if you’re like me cane syrup (just because it’s my favorite). Preheat oven to 425 F and line a baking sheet with aluminum foil. In a medium sized bowl, whisk together egg whites and sabra garlic and herb spread. On a plate, gently mix together the panko bread crumbs, rosemary, garlic powder, paprika, salt, and pepper. Dip the chicken into the egg white mixture then into the bread crumb mixture. Bake for 15- 20 minutes or until the internal temperature is 165 degrees Fahrenheit. Flip the chicken tenders at the half way mark so each side gets nice and crispy. Toast the waffles in a toaster oven until warm and crisp. Cut into fourths and top with spinach and ½ Tbsp of honey mustard spread. 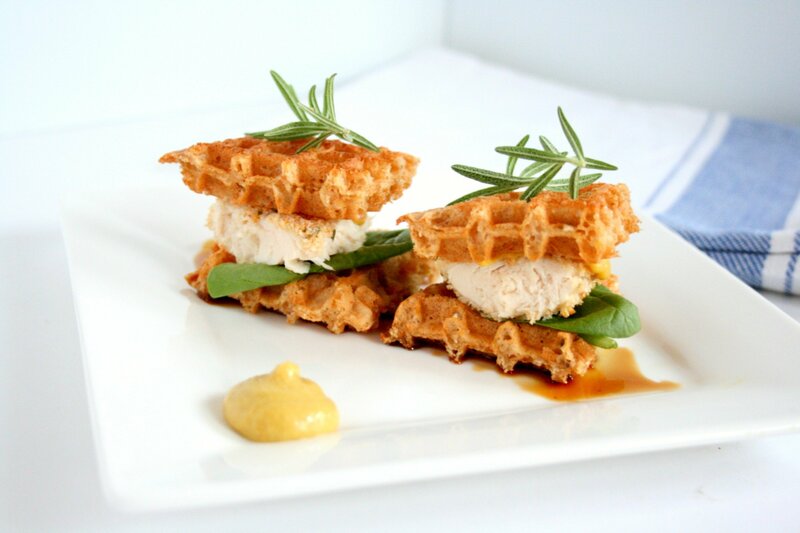 Cut the chicken tenders in half and place atop the waffles. Top with another waffle ¼th. Love the recipe? Pin it for later! So brilliant! Love this idea of the Southern classic – made healthy! Such a clever twist on a Southern classic! Don’t you love that!? I love baking chicken tenders! Thank you so much sweet friend!